Lobster lay in a crate at the Stonington Lobster Co-op dock in this Aug. 15, 2014, file photo. 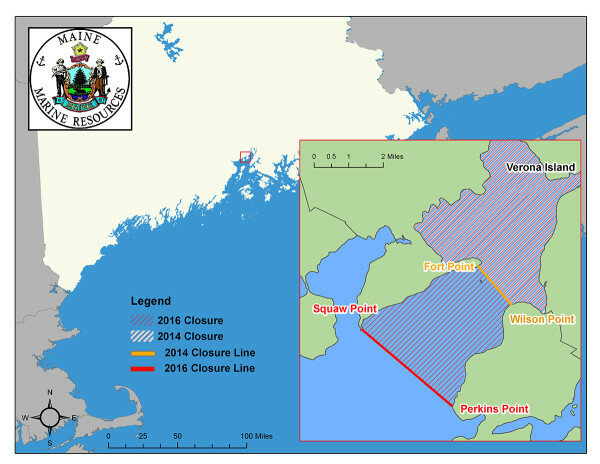 Maine Department of Marine Resources chart showing the fishing closure areas at the mouth of the Penobscot River in the upper portion of Penobscot Bay. 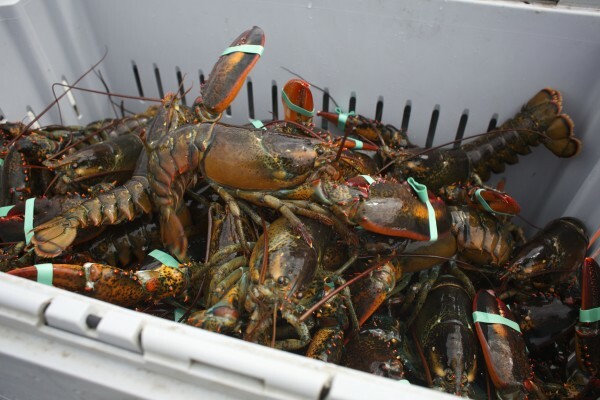 STOCKTON SPRINGS, Maine — Mercury contamination found in lobsters caught in the uppermost portion of Penobscot Bay has led to this week’s decision by state fishery officials to nearly double an area closed to lobster and crab fishing. Officials with the Maine Department of Marine Resources also stressed, however, that the total 12.5-mile closure area at the mouth of the Penobscot River and the upper portion of the bay is a tiny portion of the more than 14,000 miles in the Gulf of Maine where lobsters are harvested. DMR also said that the amount of mercury found in crustaceans in the newly closed area is less than the levels found in a can of albacore tuna. “We are adding this very small, targeted area to the closure so consumers can continue to be confident in the exceptional quality of Maine lobster,” Commissioner Patrick Keliher said in a press release issued Tuesday. The new 5.5-square-mile closure area is located directly south of the 7 square miles that were closed to lobster and crab harvesting in 2014. The source of the mercury has been traced to the defunct HoltraChem plant in Orrington. The decision to expand the closed fishing grounds was made after the state analyzed data gathered east of Cape Jellison during 2014, and is designed to ensure consumer confidence and public safety, Jeff Nichols, the DMR’s communication director, said Wednesday. He added that the 2014 closure has not appeared to negatively affect the Maine lobster industry. The 121 million pounds of lobster caught last year in Maine was worth a record $495 million, DMR reported in March. The state did a two-year mercury sampling program in 2014 and 2015, and the analysis of the data from the 2015 lobsters hasn’t been completed yet, Nichols said Wednesday. The department is not doing additional lobster sampling in the area this year. He said that the closure will remain in effect indefinitely, unless the 2015 data indicates that there has been a change in findings. State officials have highlighted the fact that the amount of mercury found in the tails and claws of legal-sized lobsters harvested in 2014 along the southeastern shore of Cape Jellison is smaller than the amount of mercury found in canned white tuna. The lobster tails contained 292.7 nanograms (a billionth of a gram) of mercury per gram of tissue, while the claws contained 139.2 nanograms of mercury per gram of tissue. Canned white tuna contains 350 nanograms of mercury per gram, according to the U.S. Food and Drug Administration. Industry officials believe that not many lobstermen and crab fishermen have been fishing in the newly closed area, and estimated in 2014 that the 7-mile closure affected perhaps a dozen fishermen. It could not immediately be determined Wednesday how many more might be affected by the additional 5.5-mile area. Sheila and Mike Dassett of Belfast are among those who fished in the new closed area, which is located in the larger Zone D, one of seven fishing regions regulated the state. Sheila Dassett, who also is the director of the Downeast Lobstermen’s Association, said this week that the couple is supportive of the mercury testing and the closure. Dassett said she is worried that the timing of the new closure might be problematic for the industry. Still, environmental activist Ron Huber of Friends of Penobscot Bay said this week that the discovery of the mercury contamination in the lobsters in the new closure area is worrisome. The closed fishing grounds are located downstream from the now-defunct HoltraChem factory in Orrington, which produced 23,000 pounds of toxic mercury waste each year between 1967 and 1982. The company manufactured chemicals for papermaking and other industries before the adoption of significant hazardous waste disposal regulations, according to legal documents filed with the Maine Supreme Judicial Court. In 2008, the Maine Department of Environmental Protection ordered Mallinckrodt LLC, the sole former owner of HoltraChem still in business, to begin removing an estimated 360,000 tons of mercury contaminated soil that is buried in five landfills. Last year, a federal judge ordered the creation of a panel of engineers and scientists to recommend cost-effective and scientifically effective ways of removing the mercury deposits left in the bed of the Penobscot River. When the state closed the 7 square miles of fishing grounds in 2014, it was after mercury was found in those lobsters in a level similar to the amount found in canned white tuna. State officials said then that the Maine Department of Marine Resources could have created a consumption advisory for sensitive populations, including pregnant women, nursing mothers and children, but decided to take a more conservative approach. Mercury is a naturally occurring metal that is toxic to living organisms, according to the National Institute of Environmental Health Sciences. Though metallic mercury, an odorless, shiny, silver-white liquid, has been used in thermometers, barometers and fluorescent light bulbs, it also is very dangerous. Mercury can be absorbed into the bloodstream with dire results, including muscle weakness; skin rashes; mental disturbances such as mood swings and memory loss; impairment of speech, hearing and peripheral vision; impairment of movement such as walking or writing; and numbness in the hands and feet. Dassett, the director of the Downeast Lobstermen’s Association, said she does not believe that Maine lobsters pose any risk to consumers. “I wouldn’t have any qualms about eating lobster,” she said. A public meeting to discuss the closure will be held at 5:30 p.m. Tuesday, June 28, at the Bucksport Area Performing Arts Center at the Bucksport Middle School.